© Goethe-Institut Kolkata/Arhan Sett Photography Ina Kaur is a native of New Delhi, currently living and working out of her studio ‘Inkspace’ in Bangalore, India. She is trained as a print-based artist, but her creative practice spreads across mediums and disciplines. Her interest extends further into creative explorations within the public sphere, social engagements, and collaboration. Kaur’s studio-research practice investigates how identities are defined and influenced by history, society and the culture in our immediate surrounding. Her current pre-occupations explore the ‘Inbetweeness’ or the ‘third space’ lying at the cusp of Localism and Globalism, which forms a new perspective ‘Hybridity’. Her works, in general, are philosophical in nature and abstract in its expression. Abstracting and simplifying rudimentary forms allows her to transition between tangible and intangible concepts. 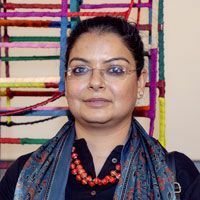 During the Indo-European Residency, Kaur will explore ‘Impressions of Cultural Patterns - its uniqueness and commonalities’. Her proposed project intends to capture a unique Identity of the place - ‘KaliKata’ - through engagements with objects of cultural, historical and social significance. She will collect and document its rich cultural patterns and textures. “The Indo-European Residency Project 2018 provided the opportunity to engage with the city, its surroundings, its cultural, ritual and materials. My influences for the idea as well as the choice of materials came from the city. Mainly from the neighborhoods of Kalighat, Kumartuli, Chitpur, Barabazar, Girish Park cloth market along with the walks along the Hooghly river before, during and after the Pujo time. Being in Kolkata during Kali Pujo and witnessing the making of the Kali, appreciating their use of local, sustainable materials, along with their skills, imagination and resourcefulness inspired me. I started developing a body of work around ideas of ‘spiritual & material’ and ‘divine and earthly’. The works utilized materials such as bamboo, cloth scraps, threads along with ‘Sondesh’ ( local sweetmeat) molds and clay works. Another work with new direction, with a working title 'Kali in us’ deals with our collective demons created by systems and its possible resolutions. The works are in progress and I am grateful for the Indo-European Residency Project 2018 to have allowed me this space and time to engage, which provided me with a new direction for my studio works''.